Coming off a Central Mass. 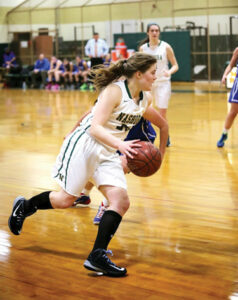 Division 2 title last year, the Nashoba Regional girls basketball team started this season on the right note, to the tune of a 49-30 opening night victory at home over Leominster on Friday, Dec. 12. Senior point guard Kelly Poole got the Chieftains off to a quick start, scoring the first five points of the season, leading Nashoba to a 9-0 lead two minutes into the contest. The early lead set the tone for how the rest of the game would turn out, as the Chieftains led 24-13 at halftime. The defense was strong for Nashoba as they held the Blue Devils to just six points in the first 10 minutes of the game. Poole (13 points) and senior forward Erin Cressman (20 points) combined for 21 of Nashoba’s 24 points at halftime and Poole’s defense caused multiple Leominster turnovers. Poole displayed her arsenal of weapons as she ran the offense, controlled the ball, executed crisp passes, made baskets and tipped many balls on defense. After neither team scored a point for the first 2:20 of the third quarter, the Chieftains extended their lead to 33-13, after their second 9-0 run to open a half. Senior forward Nikkiah Snoddy, who was scoreless in the first half, made her presence felt in the second, sparking the 9-0 run with eight second half points. Snoddy electrified the audience with the highlight of the night in the fourth quarter when she blocked a jump shot off of the shooter to give Nashoba possession. The play exemplified the hustle and energy the Chieftains played with all night. When it looked like the contest was out of reach, Leominster put together an 8-0 run of their own at the end of the third quarter, led by senior Erin Stephenson, to make the score 37-23 Nashoba after three quarters. Stephenson finished with a team-high 18 points, which was good for more than half of the Blue Devils total. McNamara told her squad to look out for Stephenson and acknowledged that she was a good player and kept her team in the game in both halves. With the game seemingly in hand, McNamara gave her bench some playing time, including the only freshman on the squad, Sarah Gillooly. Cressman played periodically through the fourth, finishing with team-high nine second half points to give her an even 20 for the night, a game-high. An area that McNamara wanted the team to improve in its 49-30 victory was shooting percentage. She noted stretches where her squad had trouble putting the ball in the hole, leading to a low percentage. “If we get those opportunities five games from now, I’m hoping that we’re going to put those in,” McNamara said. McNamara has high expectations for the team after a run of success over the last four years, so her players will need to bring it every night. 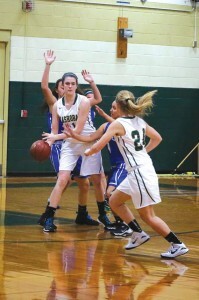 Nashoba will take its 1-0 record on the road to face Wachusett Regional on Tuesday, Dec. 16. The score was not available at press time.